Trump, discussing terror, seamlessly mentions incident "last night in Sweden". 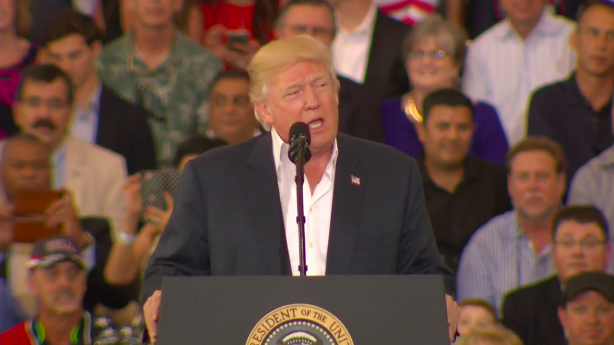 Trump claims that there was a terrible terrorist attack in Sweden last night which never happened. President Donald Trump left many people including former first daughter Chelsea Clinton confused Saturday night when he suggested that something terrible had happened in Sweden the previous evening. No tragedy occurred that day in Sweden, which the internet had fun pointing out. On Sunday, Clinton made sure to highlight the Trump administration's penchant for inventing terrorist attacks. In case you missed it, Trump made the remark during a campaign-style rally in Melbourne, Florida this weekend about two hours north of his Mar-a-Lago Club. "Here's the bottom line. We've got to keep our country safe. You look at what's happening. We've got to keep our country safe. You look at what's happening in Germany, you look at what's happening last night in Sweden. Sweden, who would believe this. Sweden. They took in large numbers. They're having problems like they never thought possible. You look at what's happening in Brussels. You look at what's happening all over the world. Take a look at Nice. Take a look at Paris. We've allowed thousands and thousands of people into our country and there was no way to vet those people. There was no documentation. There was no nothing. So we're going to keep our country safe." "Don't worry, the people of Sweden are doing just fine." She said. HOW ARE YOU CURRENTLY GETTING PAID? Provide your clients with local USD, EUR, GBP, JPY and CNY** accounts and get paid as easily as having a local bank account! Bill your clients via Payoneer and offer several simple and secure ways to pay online. Welcome to Planet Business Associates where you can find the best products at the best prices. Shop securely online today! Welcome to the world of trips. Unforgettable trips start with Airbnb. Find adventures in faraway places or your hometown, and access unique homes, experiences, and places around the world. Your own Amazon stores the smart way with Fresh Store Builder. Profitable, easy to use and no need for stock, customers or any hassle! Integrate StartApp's SDK for your monetization needs and get interactive and engaging ads that deliver high performance and eCPM. Click to Register and get a $50 when you earn $250 in the first 3 months. LAWN COMPANY ASSET SALE! COURT APPROVED Chapter 11 REORGANIZATION ----------- CHAPTER 11 REORGANIZATION---COURT APPROVED ----------- ===================== BRING OFFERS ===================== DRASTICALLY REDUCED by $1.7million +++++++++++ WAS 4.2Million NOW only $2.5Million. +++++++++++ THIS is an ASSET/INVENTORY/LAND&BUILDINGS/EQUIPMENT SALE South West Florida's ICONIC, BEST KNOWN, Most Established NICHE Commercial Lawn Contractor is seeking a strategic well funded "Lawn Industry" Merger/Buyer to take the current company to new heights. Olusola Olaniyi Planetblog. Simple theme. Theme images by gaffera. Powered by Blogger.